R.S.aggarwal Quantitative aptitude is most preferr ed book for SSC EXAMS, BANK PO, MBA, MAT, CAT, RAILWAY and many other competitive exams. for SSC aspirant, it is the most useful book for Quantitative aptitude . 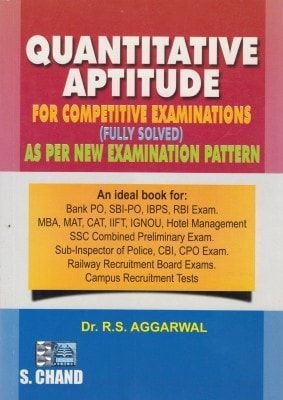 R S Aggarwal Quantitative Aptitude Pdf and in Hindi edition name R S Aggarwal Sankhyatmak Abhiyogyata (Quantitative Aptitude) (Hindi) pdf cover Problems on Numbers and Ages, Simplification, Surds and Indices, Pipes and Cistern, Boats and Streams, Simple & Compound Interests, Time and Work, Problems on Trains Permutations and Combination, Series, Odd Man Out, Clocks, Heights and Distances, and Calendar etc. The Data Interpretation part covers Tabulation and various kinds of graphs like Bar, Pie and Line Graphs.